LinkedIn - Communication - Vision! Is LinkedIn missing out on communication? Yep BIG time! About 3 years ago LinkedIn removed their event app with the usual statement saying that 'from time to time we review our services and adjust our offer to ensure the best experience for our customers' or something like this. Commendable I think? It was quite a useful app I thought. I used it to invite customers to my external webinars or public training events. Now most of us use external apps like Eventbrite. Also at the time I was searching for a free webinar app and to my delight Google launched Google+ Hangout. The web conferencing web app is amazing and works like a dream. The only problem is that today still not that many business people are on Google+. This means I have to educate them on how to use G+ and then train them on how to use G+ Hangout. Time consuming and frustrating. It ways exactly the same when Skype came out many years ago. Nobody had heard of it and didn't know how to use it. Now potentially every business person has heard of Skype and uses it. G+ Hangout also has a messaging facility, although not that great yet. Within the last few weeks (April 2015), Facebook launched their dedicated messenger app for the browser. It was already well established as a separate app for mobile, despite some complaints from users in the early days when it moved away from the standard Facebook page. It works and it works well and looks great inside a browser. I'm sure I don't have to mention all the array of other messenger apps on the market. Just have a look at the graphic below, where the number represents the number of active users in millions. Facebook with messenger and WhatsApp are pretty much dominating the space. What happened to LinkedIn? All they've got is a very basic email service, which only in the past month (March 2015) allows you to attach a file. Fantastic! Not really, I was being sarcastic then in case you hadn't noticed! Can you imagine how amazing it would be if you had the ability to instant message your connections? Alright, I appreciate that you'd be worried with spammy messages, but they could make it so that you have to invite people to your instant messenger list and request permission in exactly the same way as connection invites. I guarantee you that the current younger generation when it grows up will demand such a service on LinkedIn otherwise they'll be doing it on Facebook instead. The younger generation believes that email is too slow, they don't use it. Instant responses are something they've got used to and want to experience this when they enter the world of work. If we were able to instant message than surely the obvious extension of that would be video conference calls. The need for group web conferencing, being able to share and discuss in real-time all around the world and carry out training is absolutely essential nowadays. It just leaves the facility for events. Like Google+ the event facility would give you the option to schedule online meetings with connections or audio/video conference calls. How cool would that be? This is one massive way to get more eyeballs on your site Jeff Weiner. Conclusion: LinkedIn is definitely missing out on the massive explosion of messaging and web meetings. I look forward to the day when this will change, really looking forward to it! Are You a Modern Seller? 2015, I hope, will be the year that Social Selling goes mainstream. With that I mean that no longer should we be calling it ’Social Selling’. I prefer us all to be talking about it as ’Modern Selling’. The fact is Sales has always been a Social activity and in some ways Sales Professionals can be confused by the term ’Social Selling’. In some cases I have witnessed some really awful practices on Social Media, where bombarding folks with constant promotional material and ads are thought of as Social Selling. Let's examine ’Modern Selling’ in a bit more detail. First of all what are some current practices that look like they are going to be killed off by ’Modern Selling’. The Cold Call. Although this can be at times a useful method, it is definitely starting to drag everyone down. Who actually enjoys receiving a Cold Call these days? This most definitely will be dead and buried in B2B selling by the end of 2015, if not sooner. The Cold Email. This is a tough one actually. Email is still such a fantastic tool to get in front of folks. It's on people’s phones and therefore it's quite tough to avoid, unless you have set up a super duper filtering system and who has time to figure those out? However I know that more and more people are hitting the delete button for email. The Email Newsletter. This has been an annoying and nagging interruption for many years now. Who really wants to know about all your great achievements in the past week, month, plus reports on how great you are in the eyes of your latest customers? Nobody cares, really nobody does. I have been unsubscribing from newsletters for about 2 years now and still they continue to add me without asking my permission. I'm guilty too, because I have tried it and well failed, because I haven't felt comfortable about it and you do run out of ideas of what to say. I stopped. I do have downloadable content on my website and it’s completely optional if folks wish to be added to an email list and I state completely upfront that I don't send regular emails. Only now and again will I share some content that is in line with the content they've downloaded. Often that content has nothing to do with me, it's someone else’s content who are able to convey and support my own thoughts much better. Brochures. Yes some folks are still keeping the printers employed by cutting down trees and distributing brochures to prospects and well anyone who will have them. It's time that these are thrashed, because your prospect will anyway. Features and Benefits. This is the biggest one to crack. I would love to see this one dead and buried. Sales professionals spend most of their time practicing these in order to memorise them when in front of prospects and clients. Marketing professionals also spend countless hours presenting these in many different formats, to convince buyers to make decisions based on how their products compare with others. It doesn't make any difference to your buyer. She wants to buy your product to solve a problem. You would be better off listing problems and solutions, so she can see her problem listed. What are the alternatives I hear you cry! Personal Brand. You, whether employed, self-employed, freelance, consulting or any other process you identify yourself with and if you reading this, are already a ’Personal Brand’. This wasn't necessarily possible without Social Networks. 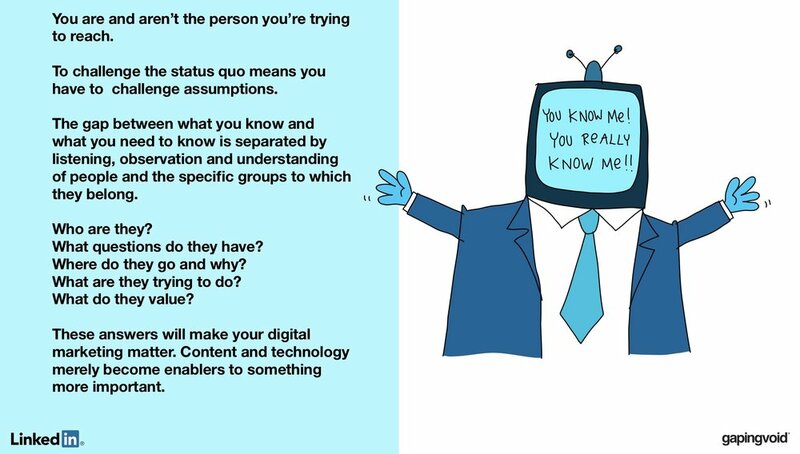 Social Networks and by being on them, have allowed you to become a ’Personal Brand’. You HAVE to take this responsibility seriously and if you don't, the consequences can be very harsh. This is the starting point, without this recognition you will struggle to get recognition. You have to craft a great story about yourself and make this consistent across all the Social Networks you exist on. Whether these are personal or business networks. Social is Social, keep the story the same across all. Folks will check you out across all of them and if they aren't in synch you will come across as random. Conversation. 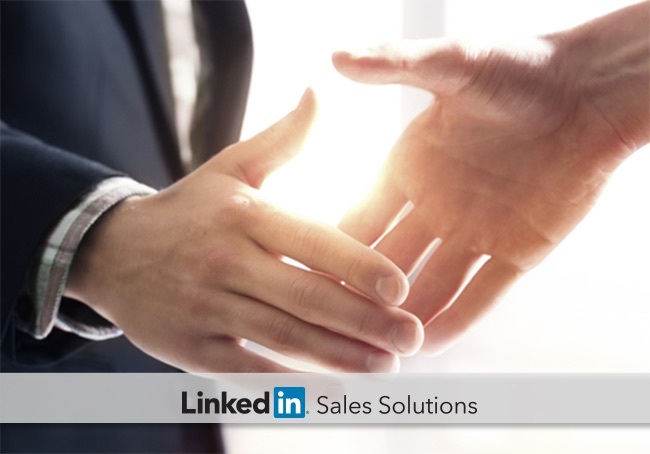 The ultimate aim for anyone in Sales or in Business is to have a conversation with a prospective buyer. Therefore your ideas, approach, strategy and intention should be about how you can have a conversation with your buyer. Your buyer won't be interested in you, the only thing on her mind is juggling and solving her problems. You are most likely an interruption to her day and as such you need to be able to convince her that time spent with you will be well spent! All your actions, communication, social posts, will be to support why a conversation with you will be interesting and more importantly a very worthwhile interruption to her day. Engagement. This is the holy grail. We all would love to have our connections become potential prospects and at some stage they will have either liked, commented, shared and loved what we posted or have written. Instead of focussing on what you can ’get out’ of your connections, instead focus on what you can ’give’ to your connections. What free content can you share with them that will help them. Share their stories and updates with your network and help them to get more exposure. The route to engagement is trust. This is all you can shoot for to start to develop a relationship. Folks will do business with people they know, like and trust. Once you build trust, which can potentially be developed online, they can start to know you through a conversation, which can be done over the phone. The ’likeness’ can only happen when they start comparing your profile with theirs and get to know you a little better. Folks are always searching for ’likeness’ when meeting new people and if there are some areas of commonality, likeness can develop quite quickly. Personality. Let your personality shine through at every opportunity. Avoid writing in the third person and reduce the amount of ’I’ statements. It actually isn't all about you. Share ’Why’ you do what you do, as this resonates so much better compared to only making statements about ’What’ you do. If you're able to share passionate insights about how you are helping folks this will also help viewers reach a better understanding about you. Gratitude. Showing gratitude to new connections for accepting your invite or in response to their invitations is an essential part of the ’Modern Selling’ recipe. Furthermore when it comes to invites, I experience too many invites on LinkedIn that have the standard default text. Asking people to give up their time to look at your profile, read it and decide whether to accept your invitation is actually a big deal. Sending a basic and standard invite therefore is actually saying that you don't respect their time, but you do want them to accept your invitation. I also liken it to talking to someone with your back turned when you meet them for the first time. Something you would never do. You can also show gratitude by engaging with your connections’ posts by liking, commenting, re-sharing, retweeting and favouriting (Twitter). We are all learning how to do all of this much better. I still have masses to learn and all of our journeys on Social Media are still very very new. Take it step by step and think about all your actions and interactions carefully and thoughtfully. When you take your ’Personal Brand’ seriously and you have respect for your connections, you can achieve great things.